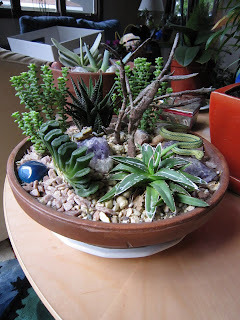 Ideally you want the pot to have a small profile because the plants most likely will not get too big. The pot I use is about two inches tall, and maybe eight inches wide. This gives me plenty of space for half a dozen plants. 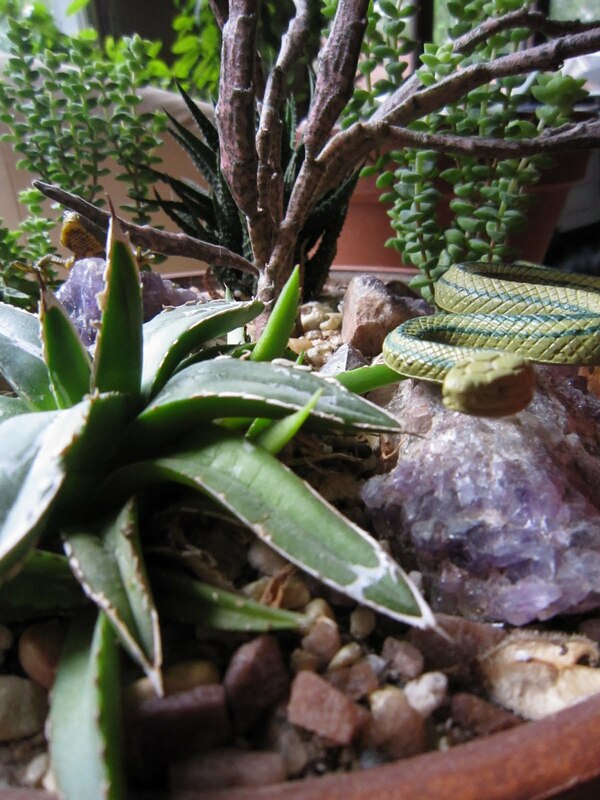 Succulents (and cacti) need really well draining soil. They cannot sit in water at all. I actually used pure sand from our sandbox. You can also use mixes of dirt and sand. Using larger rocks at the bottom of the dish also can help. 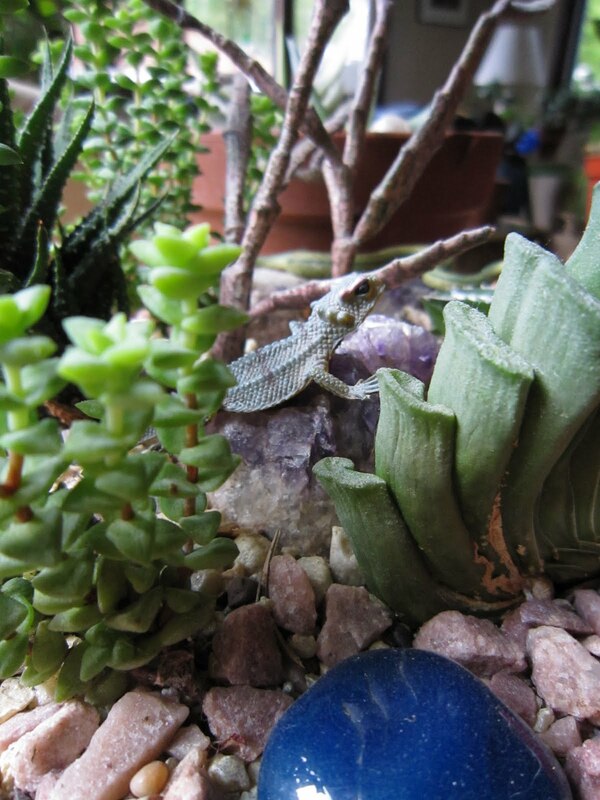 Plants: Most greenhouses or other stores that sell plants will have all their small succulents and cacti in a bunch, usually labeled something like '2 inch succulents.' These are what I use for my garden. Try a variety of plants, and don't be worried if some die right away. The plants are all grouped togetherin the store, but different ones are easier or harder to keep alive (if you're at a greenhouse, the sales people should be able to help). I will try to make a list sometime of the ones i have been able to grow and the ones that have died immediately. Once all the plants are in, I added a layer of red and white-ish rocks. Originally (and unfortunately I have not kept it up) I made a series of red paths through the garden. I also accented the green of the succulents with some purple amethyst. As a final touch, i threw a rubber snake and a rubber horned lizard. Beyond this example: You can get much fancier than this garden example. To add more depth, you can use larger rocks to create levels in your garden. In that case, you need a way to add soil to the second layer. This may mean a second dish hidden under the sand, or a hole drilled into the rock (make sure it can drain!). You can also add additional plants that have different growing conditions by leaving them in their plastic pots and simply burying the pots (this is where the decoration layer of rocks comes in handy). This way you can water just that plant more or less than the other ones depending on its needs. Full Disclosure: I placed those animals in that pot after my friends inspired me by placing dozens of plastic animals throughout my house.